Frame #1: The right arm enters upper arm first. The right shoulder is fully elevated. The swimmer's streamline from head to thigh is noteworthy. The left leg kicks to balance the right arm entry. The left arm is long and deep and about to commence a long inward and upward sculling movement. Frame #2: The right arm has entered back-of-hand first and hyper-extended at the elbow. The left arm demonstrates a very vigorous sculling movement. Its power is demonstrated by the slight curvature developed at the elbow and wrist in the long extended arm. This action produces considerable rotational forces that are counter-balanced by the right leg kick. The right leg kick also promotes rotation of the hips to the right. Frame #3: The right arm has remained straight and has sunk deeper into the water mainly because the right shoulder has rotated further to the right and is also deeper. The right hand has rotated to almost vertical. The right leg continues to kick contributing to hip roll and counter-balancing the left arm scull. The left arm moves in a primarily vertical direction in the latter phase of its "round-out" movement. Frame #4: The right arm begins to produce propulsion. The hand is turned so that it faces mainly backward, the wrist flexes, the elbow begins to flex, and the upper arm begins to medially rotate and adduct. The full right leg kick is completed counter-balancing the left arm exit, rotating the hips, and slightly disrupting streamline at the hips. The left leg prepares to kick. Frame #5: Right arm propulsion builds. Further rotation sinks the right shoulder deeper. The arm movement propulsion is primarily backward. The elbow bends to keep forces directed to the rear, the hand turns to face partly to the bottom possibly to slow or halt rotation of the shoulders and hips to the right as well as produce direct force, and the upper arm adducts. The role of the forearm for producing force can be clearly seen in this picture. The left leg kicks to counter-balance the rotational forces produced by the right arm. In backstroke, rotational forces are larger than in the crawl or butterfly strokes because the arm is much further away from the mid-line. To prevent excessive rolling, a large kick is required to counter-balance it. This is one reason why backstroke swimmers appear to kick more than crawl strokers. Frame #6: Right arm propulsion continues showing that forces created are applied almost directly backward. The main propulsive surface is the hand/forearm. The left leg kicks to counter-balance rotational forces generated by the right arm. However, the left leg also kicks the hips flatter. The left arm is well through the recovery. The right leg drops preparatory to kicking. Frame #7: It is unfortunate that the remainder of the right arm propulsive movement is obscured by turbulence and air bubbles. In another stroke in the same video from which this series of frames was derived, it is clearly shown the Lenny Krayzelburg also performs an inward and upward sculling movement with his right arm in the latter phase of the stroke similar to that displayed with the left. For the remainder of the analysis, that description will have to be sustained. The right leg kicks to counter-balance the vertical forces created by the deep-pushing right arm. Frame #8: The left arm is about to enter the water as the right arm continues its inward and upward scull. The right leg kick nears completion and the left leg prepares to kick. Frame #9: The left arm has entered with the wrist slightly adducted and flexed. The hips and shoulders roll to the left to better position the swimmer to effect an arm pull. This is aided by the left leg kick. The right arm is nearly out of the water. Frame #10: Left arm propulsion has started with flexion of the wrist and elbow, some medial rotation of the upper arm, and the initiation of adduction of the upper arm. Shoulders and hips continue to roll to the left as the left leg completes its kick. The right arm has exited the water. Frame #11: Left arm propulsion is directed almost completely backward. The hand/forearm surface creates the drag force while the upper arm is adducted and contributes most of the power. The shoulders and hips are extensively turned to the left. The right leg prepares to kick. Frame #12: Left arm propulsion continues. The role of adduction is clearly seen when the position of the upper arm in this frame is compared to that of the previous frame. The right leg kicks which starts the shoulders and hips rotating back in the other direction. The recovering right arm is well past vertical. Frame #13: Left arm propulsion is back and down as the elbow begins to extend and adduction is completed. The hips are flatter as the right leg kick is completed. The left leg prepares to kick. Frames #14 and #15: The stroke cycle recommences. 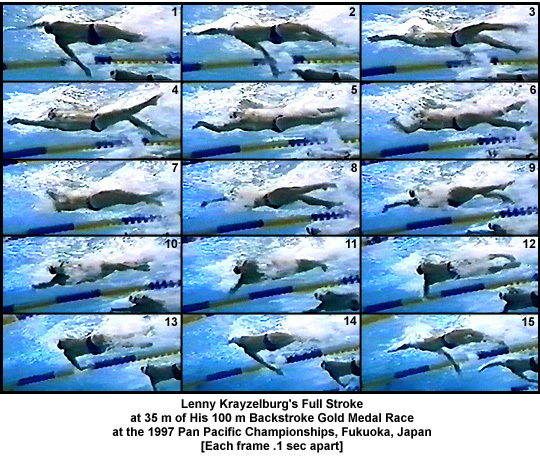 Lenny Krayzelburg's stroke demonstrates all the factors of effective, modern backstroke swimming. His streamlining is consistent with head and shoulders down, hips up, and the hips and shoulders rotating together. Both arm pulls feature early and direct force application in the stroke cycle which goes through a transition to produce a powerful inward and upward scull in the latter phase of the stroke. This swimmer's stroke is the most symmetrical, balanced, and modern of backstroke techniques displayed in the Swimming Science Journal.